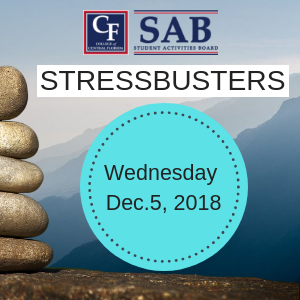 CF faculty and staff please encourage students to attend Stressbusters on Wednesday, Dec. 5, from 11 a.m. to 3 p.m. in Bedford Plaza. This event is a way to help students relieve stress before going into finals week. Free food from noon-1:30 p.m.
Free massages from 11 a.m. to 3 p.m.
Make your own holiday soap from 11 a.m. to 3 p.m.
Free laptop giveaway at 1:30 p.m.